Keep your furry little friend warm and comfortable on those cold winter nights with this SnoJam Dog Fleece bodysuit By Ultra Paws in the Buffalo Dog pattern in Black and Taupe! 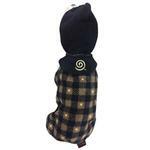 The SnoJam Dog Fleece bodysuit in the Black and Taupe Buffalo Dog pattern provides your pup with full body comfort as well as warmth from the soft polyester fleece material. 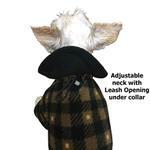 Comes with a small opening on the back to easily attach a leash. 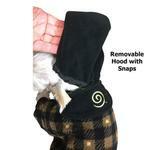 The fleece hood has a simple snap-on, snap-off feature. 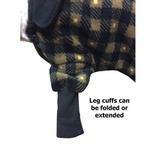 The extra-long jersey cuffs can be extended for pups with longer legs, or folded up for pups with shorter legs. 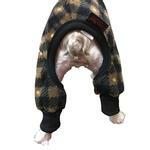 This fun fleece is the perfect winter gift for any furry friend big or small! SnoJam Dog Fleece Bodysuit by Ultra Paws - Buffalo Dog, Black/Taupe Customer Photos - Send us your photo! Rascal is a 9 lb. 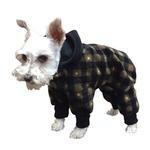 toy poodle and needs to have coats to geek him warm on cold days. 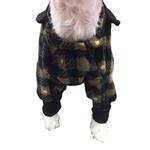 I'm a big boy and I need to stay warm for winter and everyone loves me in my new pjs that I got for Christmas. Posted On 01/29/19 by Lisa S from Halifax, PA Yes, Lisa S recommends this product! My toy poodle is loving the fleece. It keeps him warm and cozy on those chilly winter days and it matches his chocolate fur! I got this for my dog. It's hard to find things because he's so big, but I like this the legs were too long but I just fold them up, otherwise would get again. One of the best companies I have ordered from yet! Super fast shipping, great product descriptions, items well packed, very clear on shipping information, hand written thank you goes a long way in my book! Will definitely order through them again! !